Whatever the season, I think it’s hard to beat Calamagrostis x acutiflora ‘Karl Foerster’. Introduced in the 1950s, by the pioneering German nurseryman of that name, this ornamental grass has been tried and tested by generations of designers and gardeners alike. 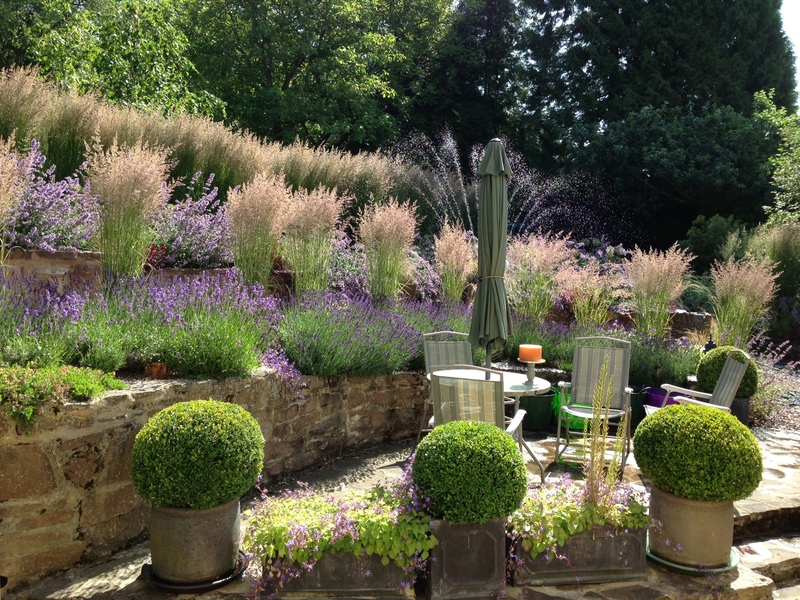 Commonly called feather reed grass, it excels on an inhospitable windswept slope in the garden at Barn House, changing appearance dramatically as the seasons unfold. 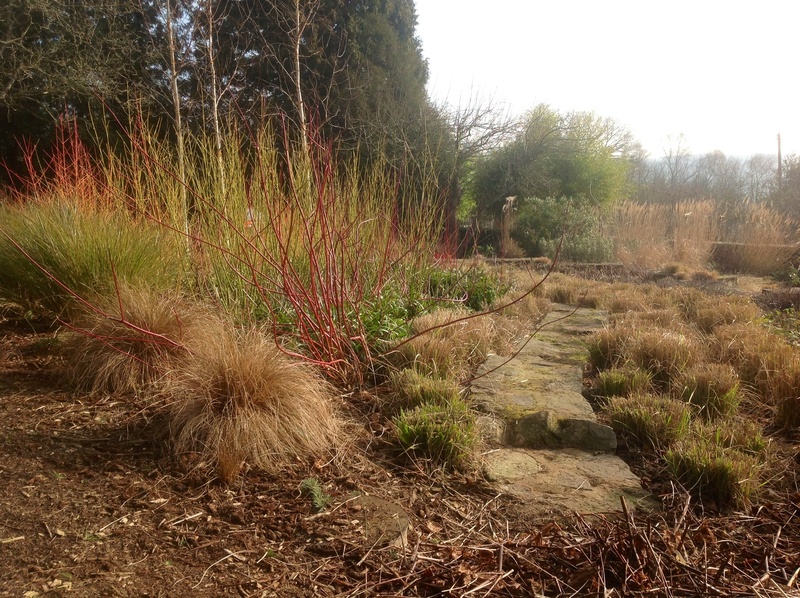 By early March, calamagrostis is the first deciduous grass into growth. It’s so well suited to cooler conditions, it just races away. The plain green leaves of calamagrostis blend among the bright beacons of coloured bulbs. Tulips don’t do well in our heavy clay soil, but the Emperor series or, as above, ‘Brown Sugar’ haven’t done too badly in a free draining raised bed. 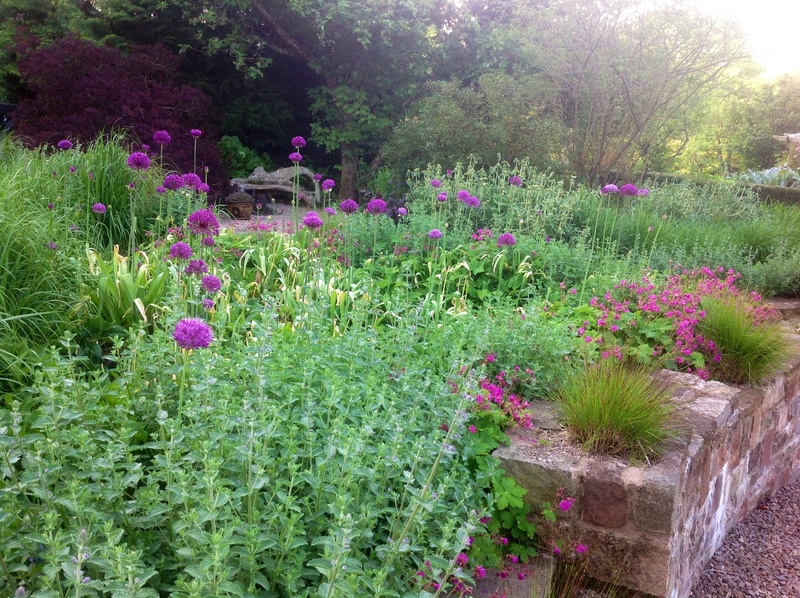 Alliums, like Purple Sensation, interplanted with Nepeta ‘Six Hills Giant’ fares better. The lower terrace, punctuated with sentries of a variegated form, divides the gravel path from a low lavender hedge. From April the new leaves of Calamagrostis x acutiflora ‘Overdam’ are flushed wiith a subtle pink tinge; paling to a shimmering silver and light green by the end of May. ‘Overdam’ is a variegated form, at 4′ in full flower (a foot shorter than the plain green form). This a useful, more compact plant to add height without blocking the view of the upper terrace. 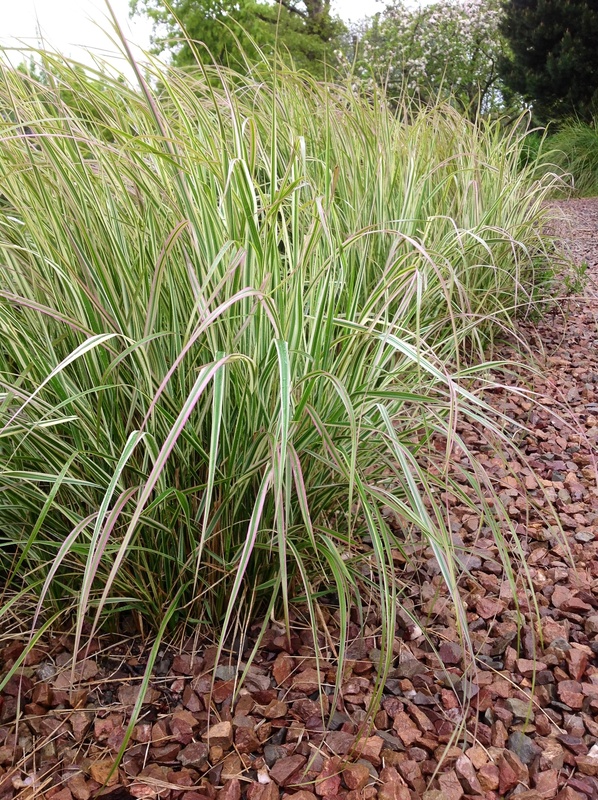 As a cool season grass calamagrostis flowers earlier than most other ornamental grasses, and, as a sterile hydrid, the borders aren’t alarmed by seedlings. The upper terrace was affordably stocked from fist sized pieces of several original clumps that had been subdivided over the years. In mid summer, the terrace planting is thought to be at its ‘best’ in its Wimbledon colours, that is, according to our helpers doing the teas on NGS day. The lavender and nepeta provide the strongest hit of purple, even the fresh inflorescences of the grass are tinged with a smoky haze. Elsewhere, it blends quietly into the background of a more subdued scheme. 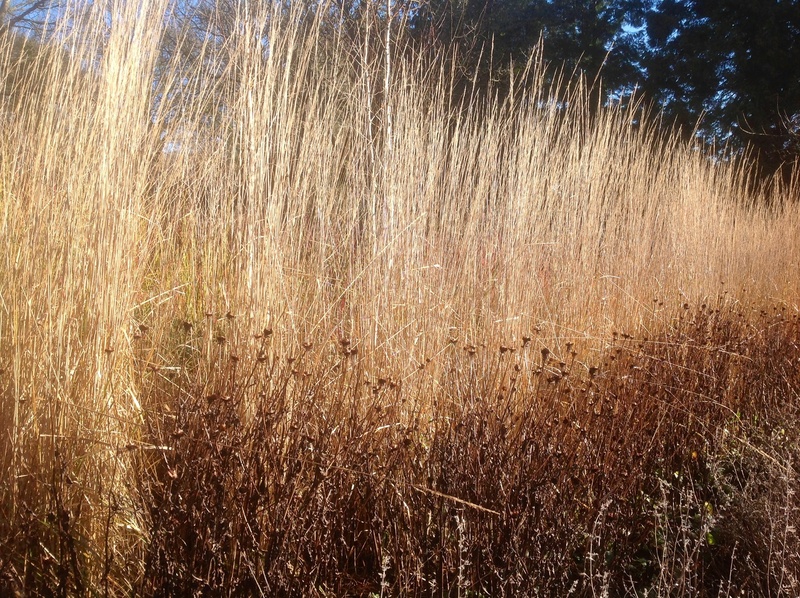 If there is one criticism of some cool season deciduous grasses, calamagrostis included, it’s that they ‘rest’ in high summer – when dormant their leaves take on a straw like appearance. Added to which, if overly stressed by heat and drought, they may be marred by a touch of rust. In a formal mixed border, this isn’t such a flattering look. 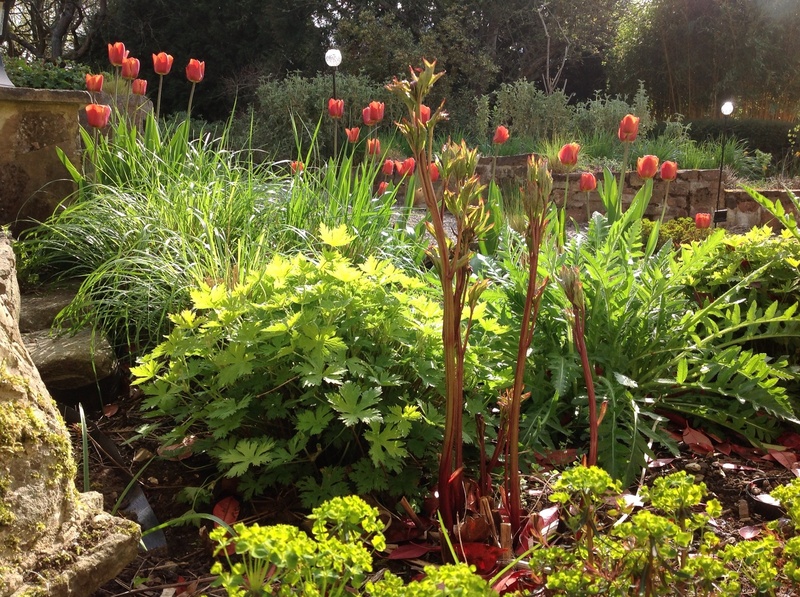 Skirting the grass with other perennials, or positioned so their flowering stems rise among or behind the planting helps hide the drying clumps of leaves. Sedums, long flowering geraniums, periscaria or mounding forms of low growing grasses still in active growth, can all lend a helping hand. 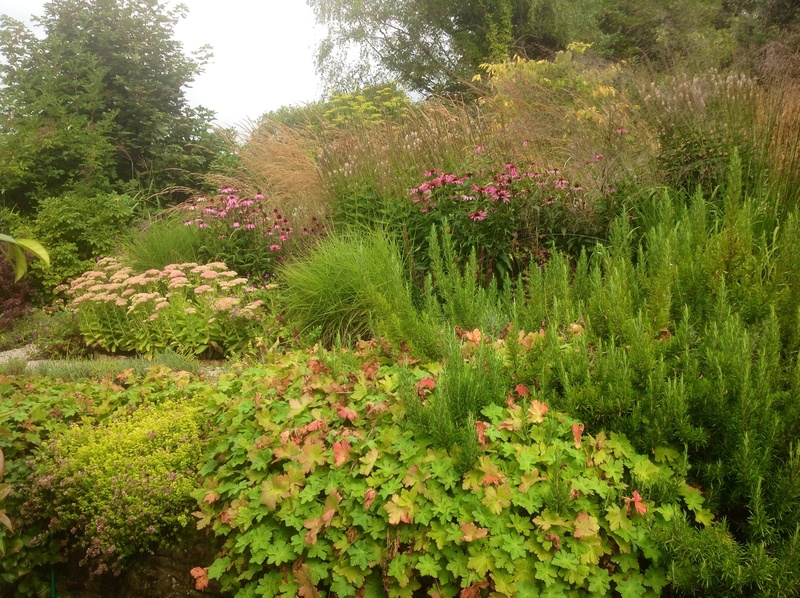 By autumn the warm season grasses and late flowering perennials are at their peak, often richly coloured and glossy leaved, while the calamagrostis happily takes a back seat. By now, the grass’ seed heads are bleached pencil thin accents. As in spring, calamagrostis acts as a foil against which a host of boldly coloured late flowering perennials strut their stuff, including strident custard powder yellow rudbeckia, candy pink liatris and stately veronicastrum. Even on an overcast day, it’s a cheerful sight. Yet, I value calamagrostis most for its subdued winter elegance, minus the fanfare and distraction of the rush of spring and summer colour. For three months the view from the house is a restful study in shades of brown. 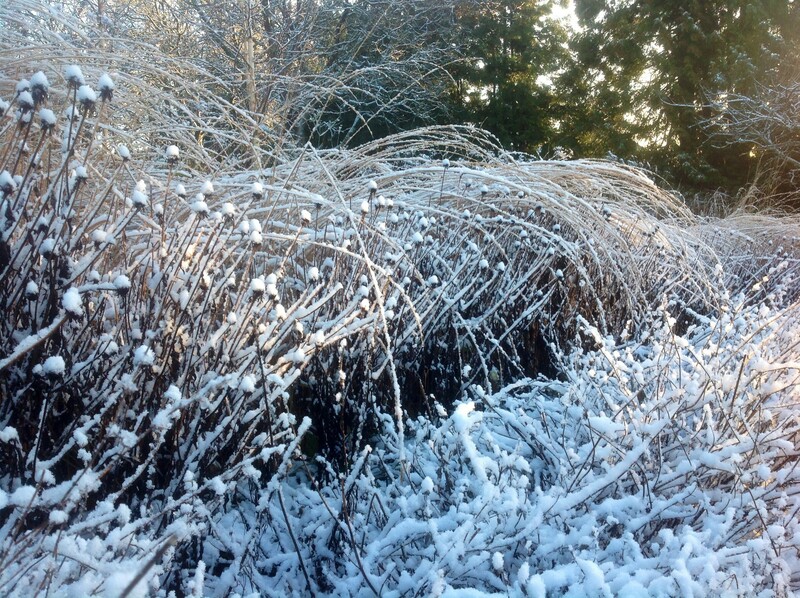 Partnering grass with seed heads is touted as a classic combination to take plantings through the winter. I find, that in my garden, that calamagrotis and rudbeckia looks good for longest. Also, I especially enjoy calamagrostis juxtaposed with shrubby phlomis or the coloured stems of dogwoods. In outline the grass is thinned by the frequent frosts the slope’s axis attracts. Once in a while, calamgrostis delights me, not just with a sparkling last bow, but by the way it casually returns to the upright, shrugging off the weight of a wet smattering of snow. 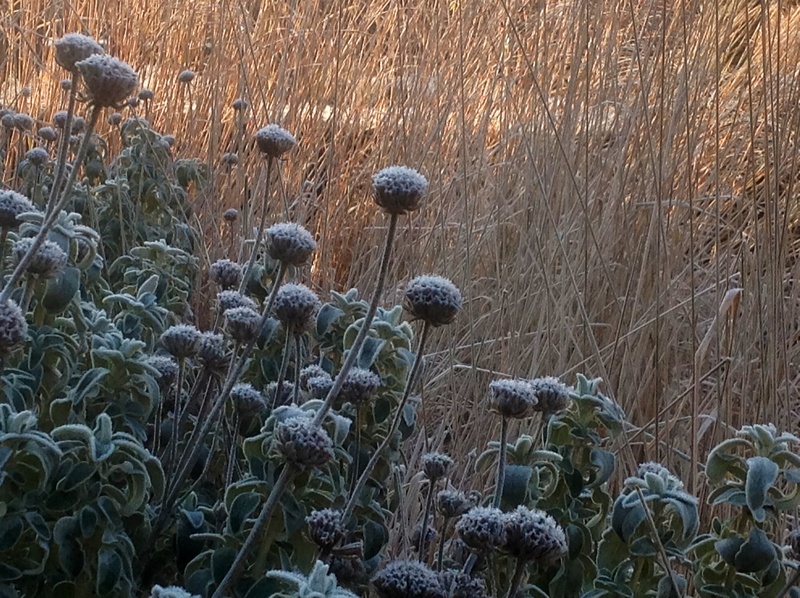 This was taken on the day the calamagrostis was cut back in February. Technically, this is the worst time of year to scrutinise it, but I like the neat rows of stubble hugging the lines of the hard landscaping of the access path. Fashions in plants come and go, grasses are no exception. For me, Calamagrostis x acutiflora is a keeper because it does exactly what I expect it to, whatever the season.